"Be a warrior." Whoa! Disney has launched the second official trailer for Ava DuVernary's adaptation of A Wrinkle in Time, based on the novel by Madeleine L'Engle, and it's quite epic. This trailer is packed full of some crazy awesome sci-fi footage, this you need to see. The sci-fi fantasy story follows three people - Meg, her brother, and her friend - who are sent into space by three peculiar beings in order to search and find their missing scientist father. 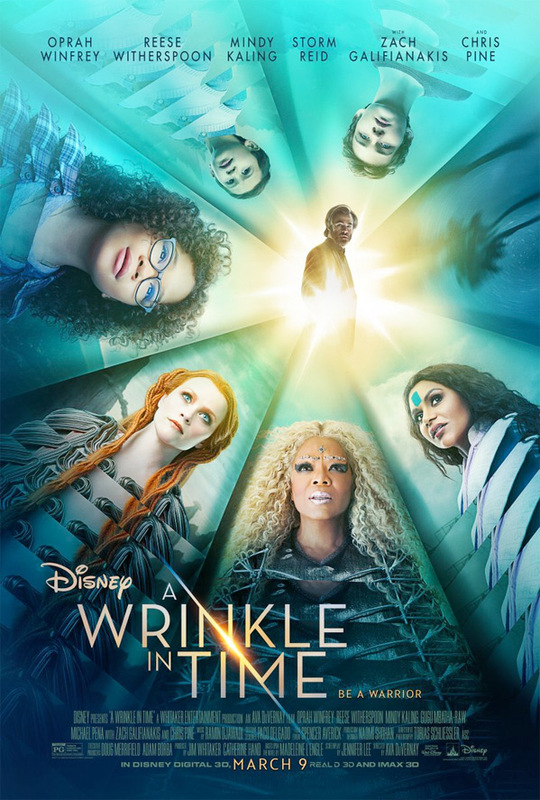 The very impressive ensemble cast for this film features Chris Pine, Reese Witherspoon, Gugu Mbatha-Raw, Michael Peña, Zach Galifianakis, Oprah Winfrey, Bellamy Young, Mindy Kaling, Rowan Blanchard, Levi Miller, André Holland, Daniel MacPherson, Will McCormack, Deric McCabe, along with Storm Reid as Meg. This looks great! I'm very excited to see it. You can also still watch the first teaser trailer for A Wrinkle in Time here, to see more footage from this. For more updates on the movie, follow @WrinkleInTime on Twitter. Or you can follow Ava DuVernay @ava. The film, which is an epic adventure based on Madeleine L’Engle’s timeless classic which takes audiences across dimensions of time and space, examining the nature of darkness versus light and ultimately, the triumph of love. A Wrinkle in Time is directed by talented American filmmaker Ava DuVernay, of the films I Will Follow, Middle of Nowhere, and Selma previously, as well as episodes of "Queen Sugar". The screenplay is written by Jennifer Lee (Wreck-It Ralph, Frozen, Zootopia). Based on the bestselling novel written by Madeleine L'Engle, first published in 1963 and receiver of the Newbery Medal. Disney will release DuVernay's A Wrinkle in Time in theaters everywhere starting March 9th, 2018 next year. Your thoughts?